Four-in-a-row, curling, Twister and a big trampoline! The British summer means we have a three-day window where we can enjoy The Great Outdoors and be active at the same time. We’ve moved on from the days of swing ball, which might be the worst game of all time, and there are far better outdoor games available to choose from. It’s not just football and arguing over who’s forced to be the goalkeeper or a shrunk-down version tennis where the ball bounces no more than two inches off the ground. No, these are full-blown games that work perfectly when you’re surround by garden fences, excitable family members and a yellow ball of fire in the sky. These are the best outdoor games you can get. It’s Twister but repackaged for your garden. You could quit your job, get on a flight thousands of miles East, trek up the biggest mountain you see in the distance and the first remote villager you find there will still have heard of Twister. Everyone knows what it is. 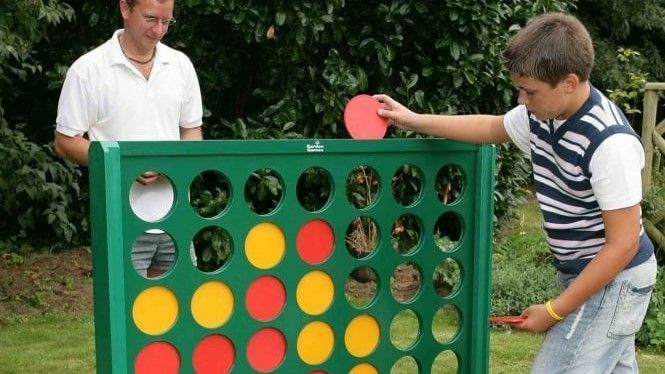 But not everyone knows that Twister now comes in ‘Picnic Blanket’ form, where it can be rolled up and carried away with a small handle after playing. It even has a waterproof backing on its underside while the spinner is attached to a keychain, so it doesn’t get lost when someone accidentally kicks it trying to drag their left foot onto a red circle. Perfect for gardens, parks, and remote mountains. No, it’s not Jenga. This is Giant Tumble Tower! A game with wooden blocks where you have to take o block from the bottom and place it at the top without toppling… okay, look, it’s Jenga. Just don’t tell their lawyers. This is a giant version of the classic game though, which can reach up to three feet tall. Having Je… sorry, Giant Tumble Tower blown up to this size does make it more fun to play, simply because it’s far more chaotic when the wooden tower collapses. It’s also quicker to set up and the bigger blocks make picking out each piece far more dramatic than you’d expect, given all you’re doing is trying to pick up a wooden block in your backyard. If someone tells you they have a garden at their house, and they have children, you can expect that garden to be home of one of two things – a battered football goal with a torn net or a trampoline that was used once in 2011 and never again. The problem with trampolines is they seem great in theory but the reality is often different, thanks to the springs not being ‘springy’ enough and the sudden danger of a mistimed jump sending you flying into next door’s garden. This Sportspower trampoline solves both problems, in that you can soar into the air off its springy pad and it has netting to ensure you won’t hurt yourself. It’s even easy to fold away if you’ve decided you have had enough, avoiding the eye-sore problem unloved trampolines cause in gardens. It goes against every journalistic instinct we have to copy and paste something the manufacturer has said as part of a review. Then again, we didn’t get our journalism degree to review an outdoors curling game, so forgive us this one-off. “TRULY, THIS KID’S GAME IS FOR THE WHOLE FAMILY,” it says (caps the author’s own, not ours). “We’re getting an overwhelming response that this is a game for the whole family.” So there you have it. It’s designed for tables but works outdoors too, on a garden table or on the ground, as long as the ground is flat. It’s cheap, light, and yes, kids can play against adults. Here’s a game that’s simple as it is fun. You have a giant board and you take turns to drop coloured pieces into the board, trying to line up four pieces of your colour. It’s a brilliantly original idea, one that’s so wonderful executed you’ll wonder how no-one has come up with… yes okay, we’ll admit it. Garden Games Big 4 is sure to set lawyer’s faces twitching at Connect 4 HQ, as this is essentially a carbon copy of it, albeit blown up to mammoth proportions. The point is that Connect 4 is great fun and so is this, the physical ‘clunk’ of the giant pieces falling into place amplifying one of the most satisfying aspects of the table-top version.